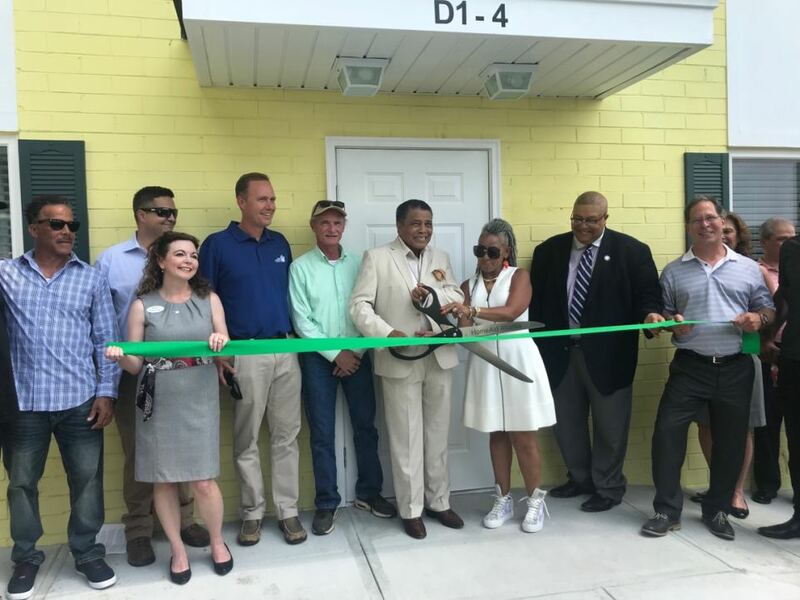 Cutting the ribbon at Making A Way Housing on July 19, 2018. ATLANTA - Aug. 1, 2018 - PRLog -- On July 19, 2018, HomeAid Atlanta and Making A Way Housing supporters gathered on Atlanta's west side to celebrate the completed renovation of an apartment building with a ribbon cutting and dedication program. This project added 16 new beds at Making A Way Housing, which provides emergency, transitional, and permanent supportive housing and case management to homeless adults, male and female, facing complex challenges associated with chronic homelessness, substance abuse, mental illness, and HIV and AIDS. "When we saw the challenges facing families and individuals in this area of Atlanta, we knew we could make a difference and work together with some great partners to change the landscape of the area. Our mission at Brock Built is to enrich the lives we touch, and we felt this project helped accomplish our goal," said Steve Brock, president of Brock Built Homes, who served as HomeAid's volunteer Builder Captain for this project. The Brock Built Homes team, in partnership with HomeAid, transformed the exterior of the building with fresh paint, new doors and windows, as well as new interior finishes including low maintenance laminate flooring and updated GE kitchen appliances. The project also included updated plumbing and light fixtures throughout, a new roof, and a new HVAC system. The apartment building is now known as The Gertrude Iraldo Thompson Memorial Building, in memory of Making A Way Housing Executive Director, Liz Thompson's mother.